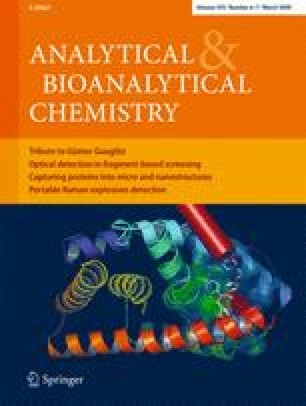 An analytical methodology based on an on-line sample enrichment of water samples by means of an imprinted polymer, and the separation of benzimidazole compounds within a C18 column by ion-pair reversed-phase liquid chromatography, has been developed. The molecularly imprinted polymer has been synthesized by precipitation polymerization using thiabendazole as template molecule, methacrylic acid as functional monomer, and divinylbenzene as cross-linker. Initial experiments carried out by solid-phase extraction on cartridges demonstrated a clear imprint effect for thiabendazole, as well as the ability of the imprinted polymer to selectively rebind several benzimidazole compounds. The developed methodology has been applied to the quantification of thiabendazole, carbendazim, and benomyl in river, tap, and well water samples within a single analytical run at concentration levels below the legislated maximum concentration levels. In this sense, detection limits of 2.3–5.7 ng·L−1 have been obtained for the analysis of benzimidazole fungicides in different water matrices. Recoveries obtained for the determination of benzimidazole fungicides in spiked samples ranged from 87% to 95%, with RSD below 5% in all cases. The authors wish to thank CONACyT (46558-Y, Mexico), DGCYT (CTQ2005-02281), Comunidad de Madrid (S-0505/AGR/0312), and Universidad Complutense de Madrid for financial support.